When I went through and edited these pictures, I couldn't help but think, given the background, that I look like a character in a cartoon! With all of the colors and bright shapes it seems quite fitting! The picture at the end, which represents my feeble attempt at doing an action shot, also helps to establish the cartoonish feel of today's post. Today I am wearing a tassel dress from Make Me Chic. I have actually become quite fond of two things in terms of wardrobe this summer: dresses and tassels. 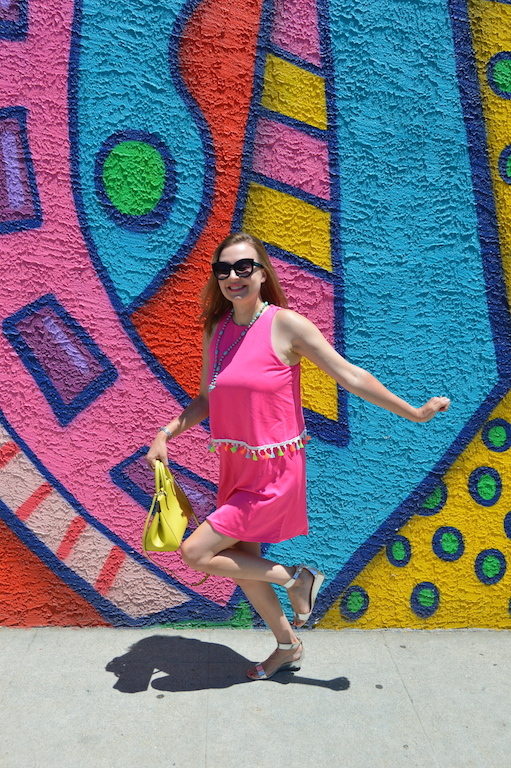 So since this dresses combines both these things together, it's the perfect summer dress! One of the reasons I have gravitated so much towards dresses this summer is that I've actually found that, as a woman, they are the most comfortable thing you can wear to keep cool during these hot months. Nowhere was this more apparent than during my recent trip to the South. Regarding the tassels, I am not really sure why I like them but they are colorful and create movement, so what's not to love? 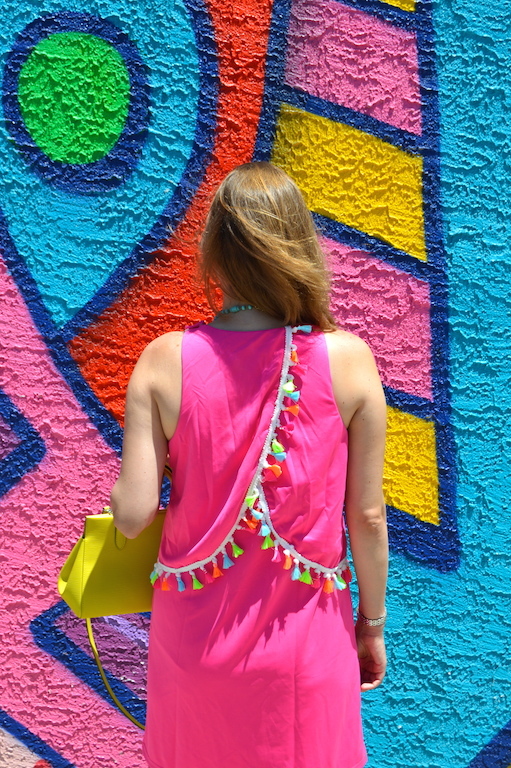 As you will see from the picture above, there are some fun tassels located on the back of this dress too! I have also included a selection of other tassel-related garb for those of you who may also find yourselves addicted to tassels this summer. Hey Katie! I love the dress and I agree the tassels totally make it. And can I say I totally appreciate the care you took in picking the photo location? So perfect with the dress. Good job! wow great pictures. The colours of the location are perfekt for yor style. Sooo cute tasseldress. Amazing summeroutfit. I've had my eye on this same dress! Love the hot pink and the tassels! 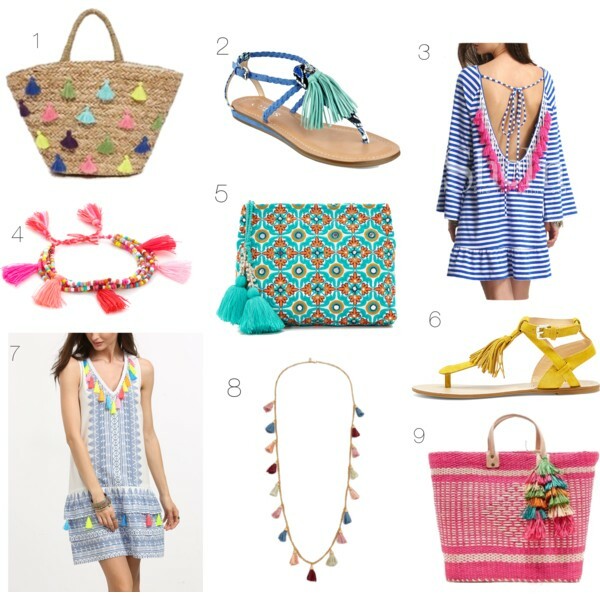 Love all the color and those fun tassels! Okay, if you do resemble a cartoon at all, it's in the best way!! I love the dress, the tassel detail is so fun. And the wall is the perfect background--you really do find the best walls!! I think the wall is great! So fun and it just adds to your super cute look, too! These are great shots! I love your dress and yellow bag! So bright and cheerful and summery. And that wall is the best background! Thanks for linking up On the Edge of the Week. I hope to see you again this Friday. Have a fabulous weekend! Love your bright colored look! 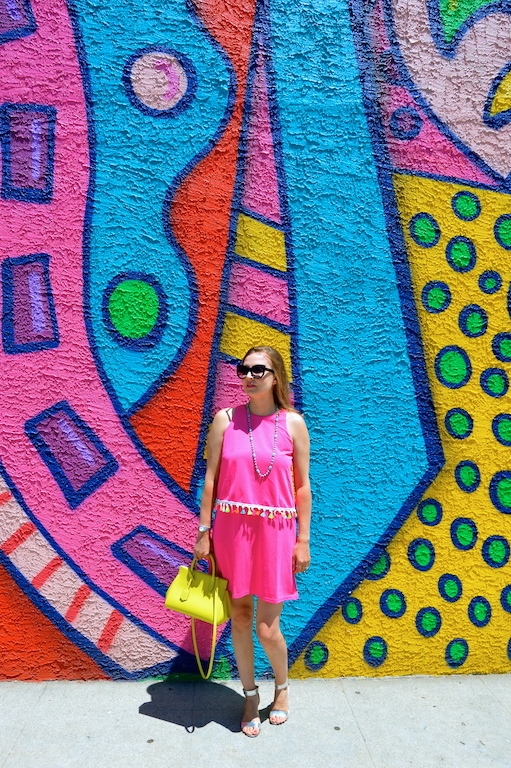 What a fun dress (and wall)! Love the colorful tassels! I love these photos! They kind of remind me of the mural ones I just posted! It's so funny how certain things get trending in the blogging world, without even realizing it! Anyhow, love that dress, but when I saw the back... omg, obsessed! Wow do you photograph the most fabulous backdrops! And that dress...amazing color! 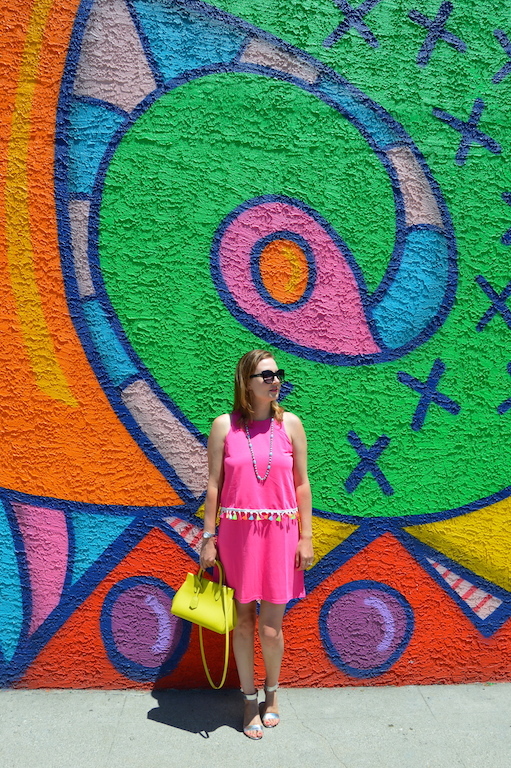 I love this colorful tassel dress - it's so pretty! I also adore how you styled it with a bright yellow purse - it's my favorite color this season!